SAT General Test is for high school students who plan to apply for colleges and universities of USA. To get better scores, some students enhance vocabulary skill as a part of effort to prepare SAT exam, because vocabulary level plays a key role in all SAT sections, either reading or writing. The web app, SAT Vocabulary Test Online, makes SAT word question sheets for test takers to build stronger vocabulary. The app's primary functionality is to produce SAT vocabulary question sheets in dynamic and random, and provide SAT vocabulary test page to host questions and your answers online. The test questions are based on a middle level SAT words list that is updated every half of year. This list is a high frequency SAT words collection, and is proven to be very helpful for test takers. 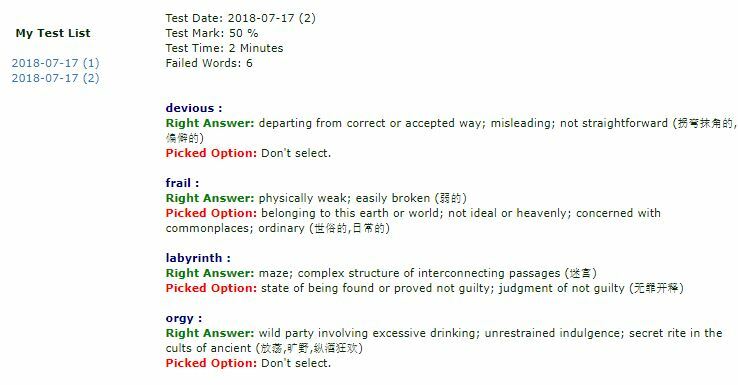 If you think the candidate words aren't fit to your scenario, you can try Test Your Vocabulary Online. It's a generic online English vocabulary test app, and is built in Basic, Middle, and High level SAT words. This is test sheet sample to get quick experience, however you cannot submit answers here. By Create test sheet you can create a real SAT vocabulary test sheet to answer and submit. In addition, if you want to save your results for future reference, you need own an account and login. Details are in Questions and Answers. n. E.g. So, are we to believe that the only thing between us and the abyss is the size of the deficit, and the more the government borrows and spends, the better off we shall be? v. E.g. The two spies betray their country by selling military secrets to the enemy. n. E.g. However, he suggests that this only be done if the convert is also willingly accepted into his position by the community. n. E.g. Which is more sad, believing drivel or having faith in nonsense? v. E.g. When the opposing hockey team scored its third goal only minutes into the first quarter, the home team's spirits seemed to flag. a. E.g. Voters see the same old candidates year after year and figure that the incumbent is usually a lock in a vast number of congressional districts. n. E.g. You know, Michelle, one thing contributing to this labyrinth is the nation's biggest private employer, Wal-Mart. a. E.g. The mobile blood bank operated by the Red Cross visited our neighborhood today. n. E.g. The penguins eat krill and small fish, and their main predator is the seal which can take them by surprise. v. E.g. She'll also be badgered to recant her 12 year affiliation with the Puerto Rican Legal Defense and Education Fund. v. E.g. Singing "Yo, ho, ho, and a bottle of rum," Long John Silver and his fellow pirates started to swill their grog. n. E.g. The main weapon of the vendor is his tongue: his stream of words builds castles in the air, blows up glistening bubbles and silences all doubt. To enjoy all features, such as to save practice data, you have to sign on at first. Want to try more and learn more? Create an account, sign on, and run this great free SAT vocabulary test app! How many quizzes and words are there in SAT vocabulary test? 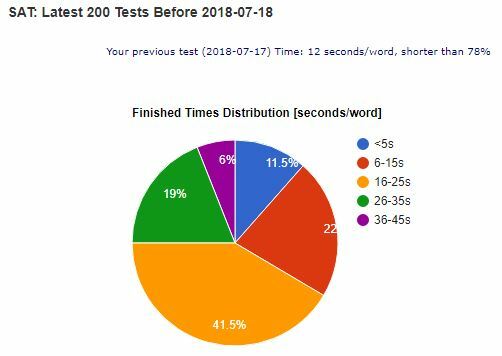 SAT vocabulary test online has 1200+ basic SAT words. Each test sheet has 12 questions that are produced dynamically. So, every time you will see different test sheet. As a free SAT online vocabulary tool, it is convenient and easy to use anytime and anywhere. Besides, it offers some features that SAT vocabulary builders are very interested. 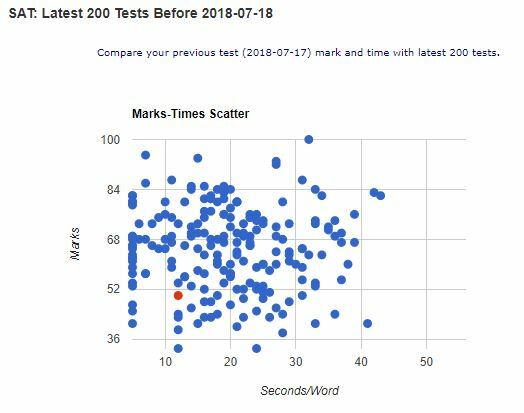 For example, you can get scores and speeds of other users to compare with own data, or view own previous test data and failed words. 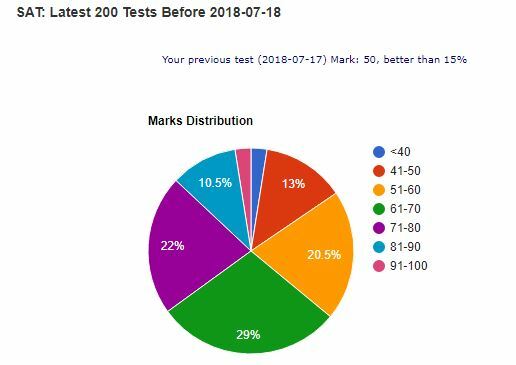 The Statistics page shows data of 200 tests of SAT just before current day, which includes both mark and duration. It's hard to say what number is good or excellent because everyone has own scenario. However, you should at least be better than average level if you want to get a good mark since the built-in SAT words are in middle level. If you are trying to have a high score in SAT test, you would reach top 10% in both mark and test duration.